For voters in Maine, a ballot question this November could completely change the way votes are cast and counted in the future. Question 5 would implement ranked-choice voting for state legislators and members of Congress. 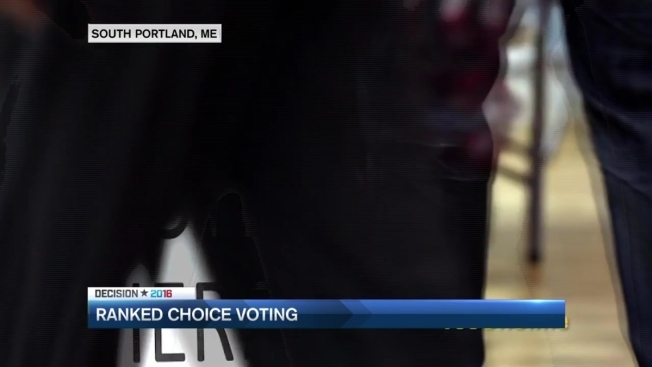 Maine would be the first state in the nation to have ranked-choice voting across the state. "This gives the voter more power," said Kyle Bailey, the manager of the Yes on 5 campaign. The ballot would allow voters to pick their first-choice candidate, but also rank the other candidates in order of preference. If a candidate achieves a majority vote, he or she is the winner. But if there is not a candidate who reaches a majority, it would trigger an instant run-off. In that case, the last-place candidate is eliminated, and the ranked choices are counted. The candidate with the most votes in the final round is the winner. "You never have to vote for the lesser of the two evils," said Bailey. Some proponents of the measure say ranked-choice voting could have prevented Gov. Paul LePage from winning in 2010. LePage won with 38 percent of the vote. The rest of the votes were split between other candidates. "I don't think this is the right way to go," said Republican Rep. Heather Sirocki of Scarborough. "It's overly complicated and confusing," said Sirocki, who pointed to a decision by the Maine attorney general that ranked-choice voting was in conflict with the state Constitution. Gov. LePage is a vocal opponent of ranked-choice voting. In a radio address this year, he called it a way for election losers to have a second chance at winning. Campaign staff for Yes on 5 believe that they only need to demonstrate how the process works to convince voters to approve the ballot question.